The magnolias are in bloom. 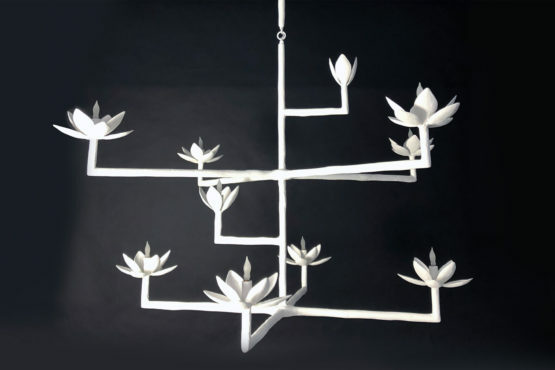 In their various stages, the blossoms conceal the lights of this asymmetrical chandelier. 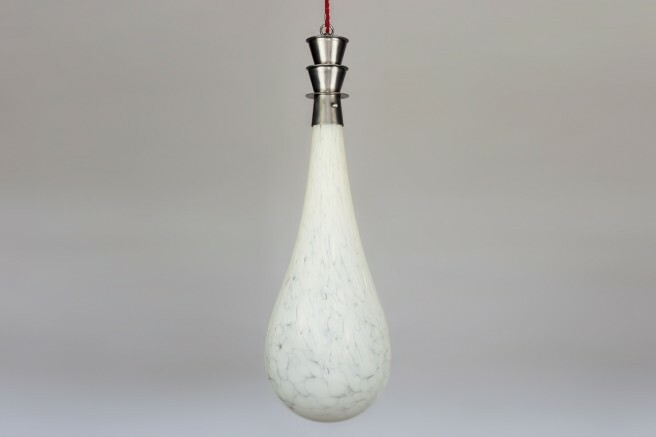 The textured plaster of Paris finish on its stately frame creates a chandelier perfect for the foyer or above a dining table. 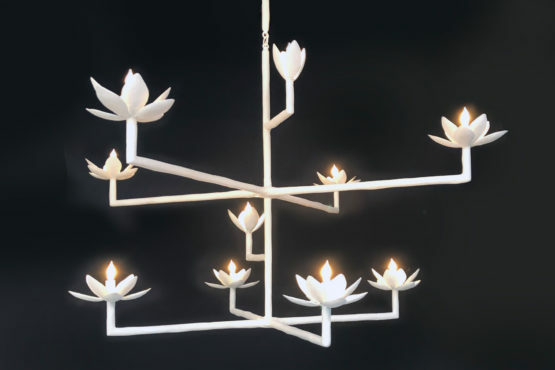 With 10 candelabra based bulbs, it provides ample light for any situation. 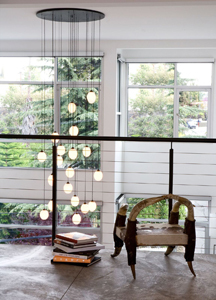 The chandelier can be made custom to meet your needs. It can be made with either a fixed down rod or chain. Model Shown Dimensions: Dia. 60”x Body 36” Over all drop : 72” Custom Sizes available. 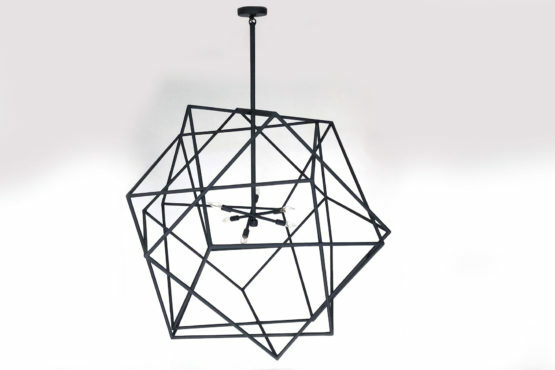 This geometric cubic chandelier is a blend of three cubes which are intertwined. The black patina plaster of Paris gives an organic fell to this creation. The chandelier has six candelabra based sockets. The finish can be done in custom colors of your choice. 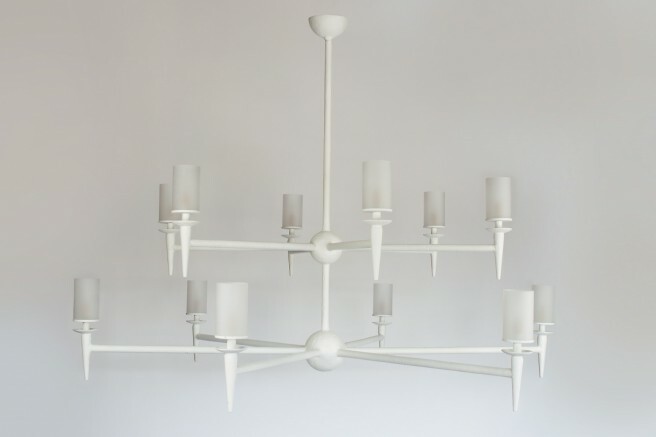 Large scale plaster chandelier with glass diffusers. The hand sanded plaster finish makes a true statement of its craftsmanship since each is hand made and one of a kind. Two options of the glass diffusers: frosted or white fret design. Custom sizes available. 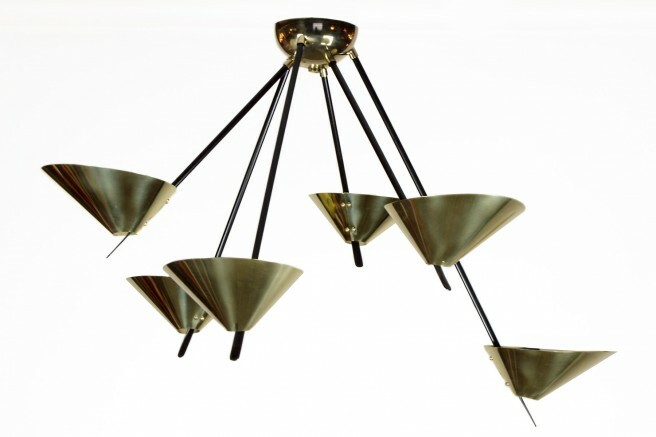 Light uses 12 candelabra based bulbs (max wattage 45) Dimensions: H. 45" x Dia. 60"
The focal point of this impressive chandelier are the six frosted handblown glass swords which shot out light in different angle. 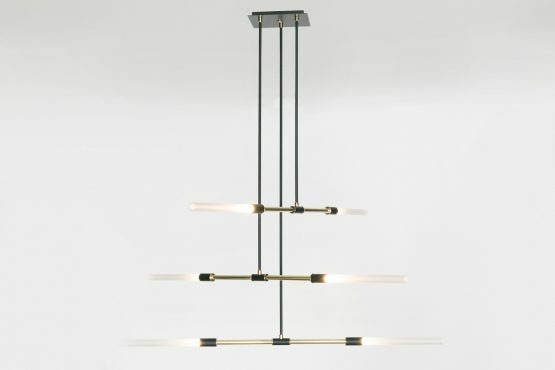 The mix of brass, frosted glass and black enamel finish come together to create a large-scale chandelier which diffuses a soft light. 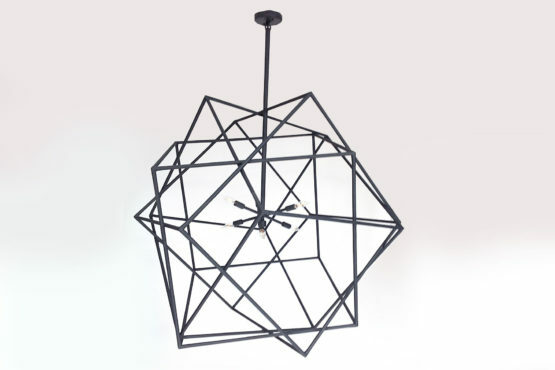 Fixture can be created with custom dimensions. Uses 6 G8 120 volt bulbs. 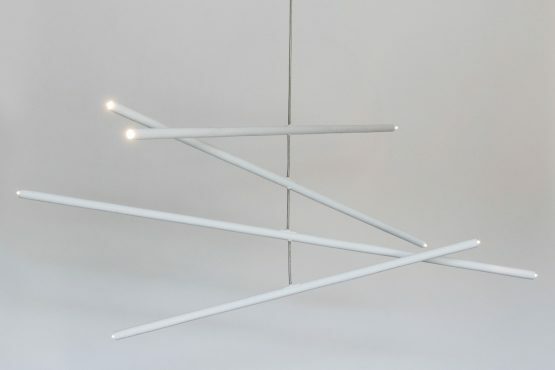 Dimensions: H. 61" x Dia.5ft. 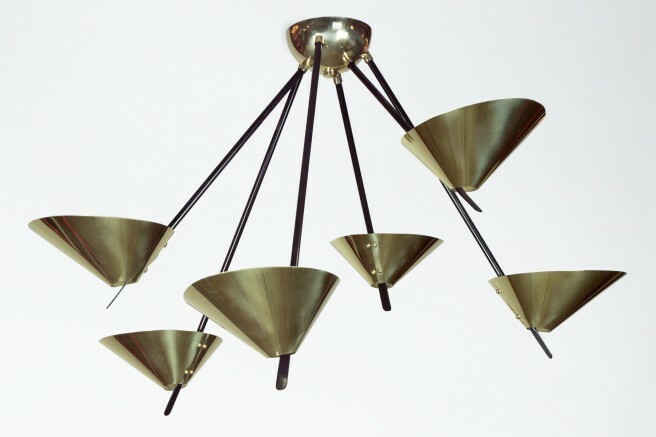 4"
This creative chandelier is ideal for rooms with high ceilings; it is light and airy yet the distinctive bronze canopy and the varied drop of the 12 lights fill the space in harmony. 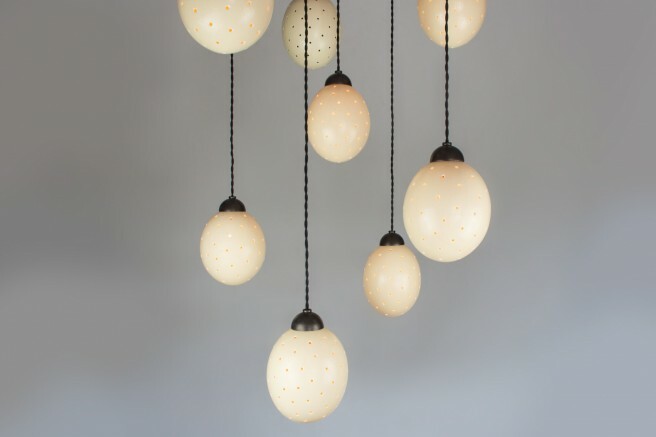 The real ostrich eggs provide for a warm atmosphere. 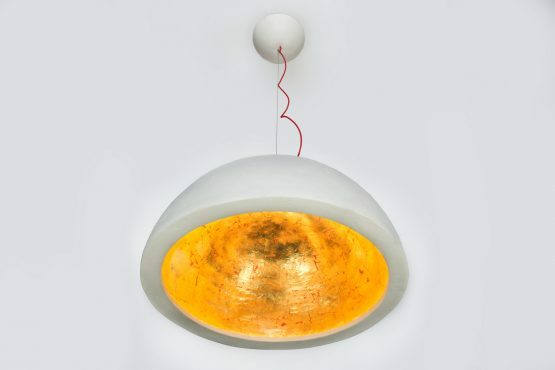 Hand blown glass diffusers can be used as well. 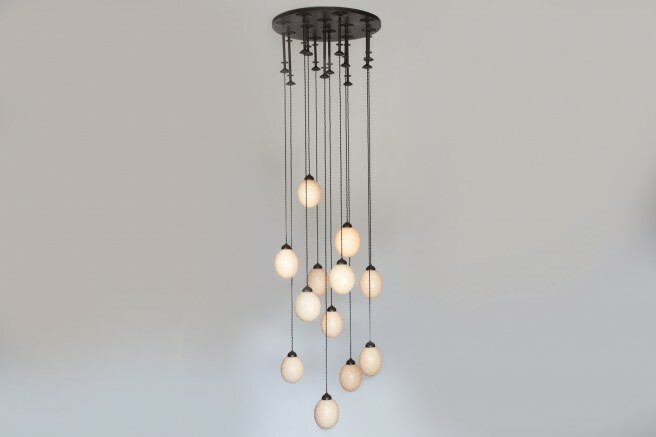 Fixture uses 12 candelabra based bulbs, Max watt 25 for ostrich diffusers and 40 watt for glass. 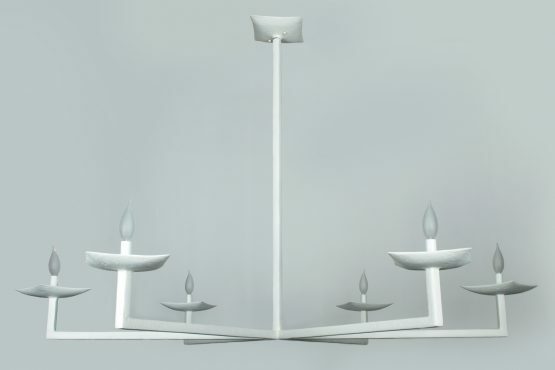 Model Shown Custom Sizes Available Dimensions: Dia.21" x Drop 91"
A fresh expression of the classic lantern created to accentuate the shimmering light, which reflects in the many contours of the glass. 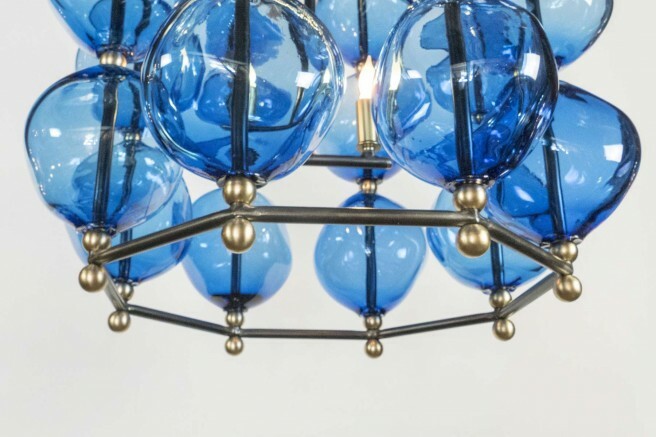 The hand blown glass orbs with their asymmetrical shapes are assembled on an octagonal gunmetal steel frame accented with brass elements. 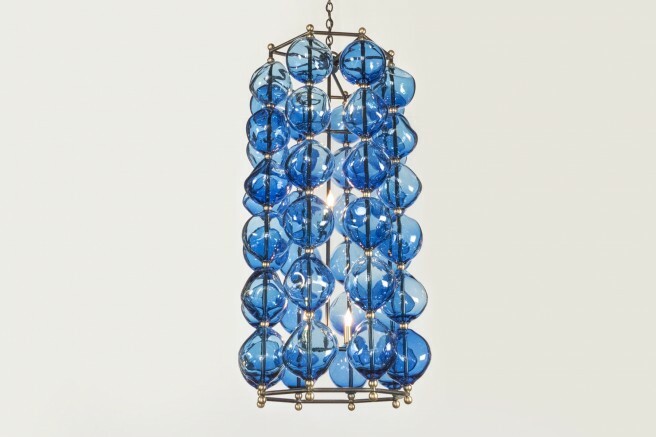 This fixture has 48 aqua blue glass globes. It can be customized to meet your dimensions and a variety of colors are also available. 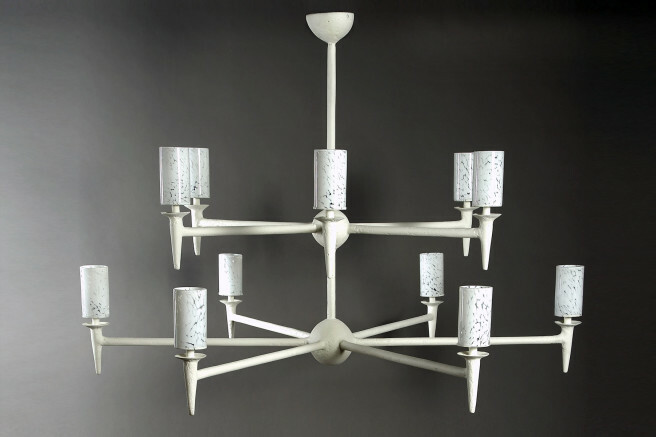 The fixture uses 6 candelabra based sockets (max wattage 60 each). Model Shown Custom Sizes Available Dimensions: H. 45" X Dia. 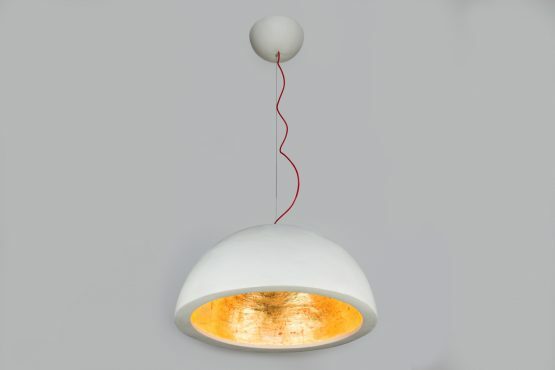 21"
This intriguing chandelier floats in the air like a mobile. 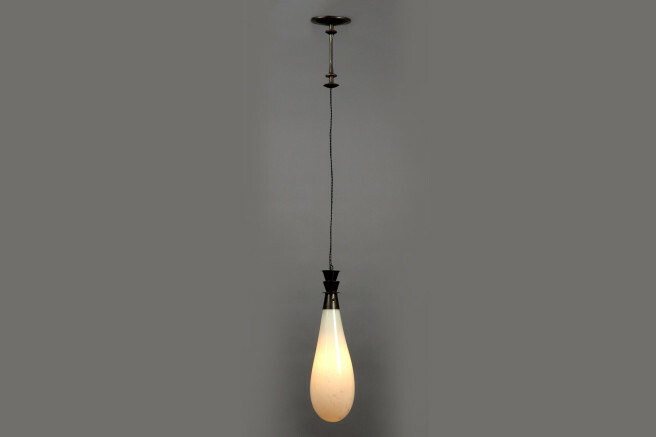 The hand finished plaster rods are fitted with halogen sockets and are suspended from a woven stainless steel wire. 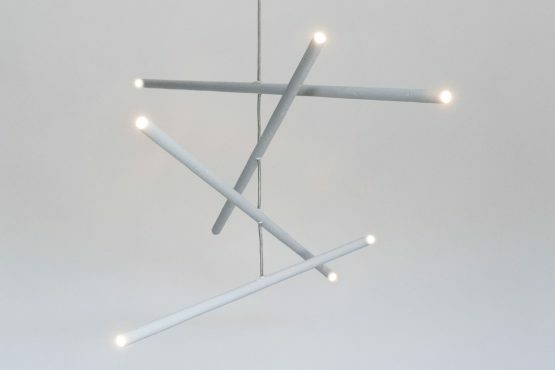 The eight lights provide a perfect ambience and light the room with a simple elegance. 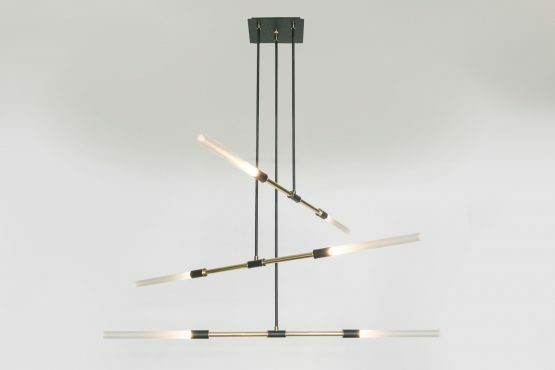 The light can be created custom in drop and length. 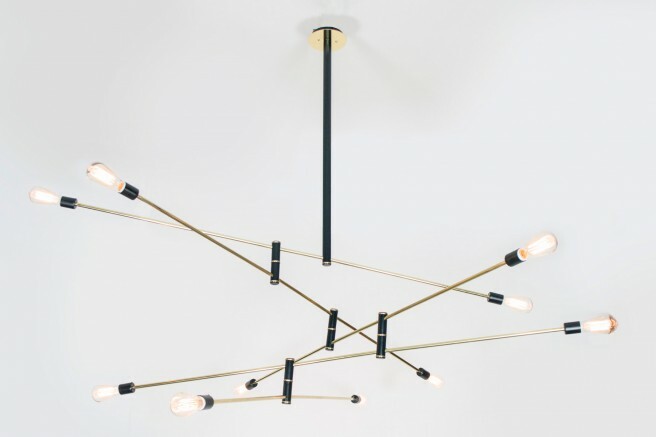 The light uses eight 120 Volt G-8 halogen light bulbs. max wattage 25 each. Dimmable Dimensions: H: Min. 48” x Dia. 62" Custom sizes available.